Those guys at Zen Studios love playing with balls, no really they do. They venture out every now and then and mix things up by making games that don't feature them, but Zen for me starts and ends at one series, that series being Pinball FX. I said this many times now, but Pinball FX is where the reviewing me began. Over the years I've grown a soft spot for these guys with them having a series I really enjoy and the team always being super nice via email, Not forgetting always looking out for their fans when it comes to prices and the releases all coming out at the same time. Infinite Minigolf was a game I'd been dying to play since they announced it, so with a few hours under my belt it's time to find out is it worth your cash. 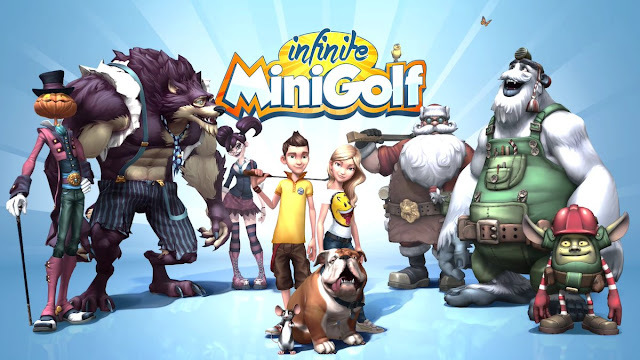 Personally, for me, the big selling point for Infinite Minigolf was the number of courses available in the game as time went on, what with user-content being a massive thing in this game, hopefully helping keep it fresh the more time went on. At the current time of writing this review, there are over a thousand holes available to play, which sounds an awful lot for a game on day one of its launch. Sadly, while reviewing this for the last few days (so I'm hoping this changes a lot now proper players get involved) the amount of awesome courses being created are slowly being snowed under with ones either created with achievements in mind, or just courses from people who haven't really made much of an effort when it comes to making it. Loading up the quick play option on any of the three available themed worlds (Home, Nightmare Mansion, Santa's Factory) you can be met with some awesome tables with players really putting their minds to work to their creations, making a hole that needs planning if wanting to do well on it and get the world record. More often than not though, it's a course with a ball one end and a hole the other with just a bunch of power-ups along the way if they are feeling extra creative. It just kills the game instantly and makes it become almost a bore to play. It's sad because when the tables are good the game can be so much fun, it's a just a shame that courses like this could ruin the game if you're someone who only loads it up for a quick play every now and then. Outside of Quick Play players also have a few offline and online modes to mess about with in their goal to level up and earn points to buy their character a bunch of pointless clothing and gear for them to wear and use. The mission menu found below is how you earn your cash for card packs available in a store on the menu, with the five-star challenges found below being the stars you require to level up your character to unlock more things to buy. You also earn points towards items when doing well on holes that you play, with these dropping you points on certain items when scoring high on them. Clothes, accessories, clubs, balls, hair, it's all here, but the truth is they do nothing other than offer a different style of the character you are using. Tournaments offer four tournaments for each themed world, with each one having a casual, normal, and hard mode to take on. Each one has a cute looking character being the face of it all, with these characters most of the time being featured in some of the courses used in it. Take Buck in one of the Nightmare tournament courses. Meet him on a course and hit the ball at his feet and he will munch on your ball and then spit it out. While not all do something cool they will be around the courses looking on when they don't. You also have local play for up to 8-players too, with a pass the pad way a play for this, and the tournament feel to these too. The final mode of play is Online, and what I've played of it works pretty much the same as a tournament, only this time you playing against real people. Versus (1v1), Tournament (4-8), Classic (4), Hole or Nothing (4), and Crazy (8) are the fun modes available as the game calls them, with Versus and Tournament being the modes available if you want to play competitively. Like I say, the games I've played (mostly 1v1) have worked well, and will certainly be something I venture into more so now that more players are starting to fill it up the modes. If you're a dab hand at creating things, then the editor portion of the game is something you could lose hours in too. If you're one of those guys who get bored halfway through things then just finish things with no passion, then please, stay away for my sanity. All the things are here to make a cool course if you have the patience, with like I said earlier, some tables already on the game that have been made by some that have talent. My HXR Hole Of Doom is there waiting for you if you fancy a challenge (little tip: full power aim left). Overall: I've enjoyed my time with Infinite Minigolf, but the game is far from perfect. The achievement whore gamers could ruin this game if they carry on making the same courses, as most are just the same course over and over again. The menus could do with a bit of text too, as things aren't really clear on what they do. Looks good. No doubt it will cost £30 or something like that and that will put people off! It's only £12. Not bad for that price! Really wish they would add in avatar support like in mini golf adventures 2 on Xbox 360. Was just talking about this game with my nephew.